Thanks to Quaxi we can now have new fences. 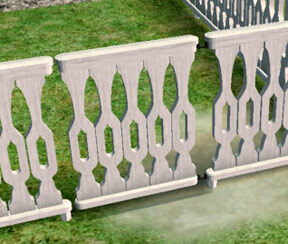 This is a new mesh for a Sawn baluster. 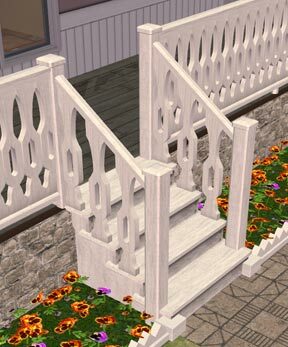 This fence works only with Uni EP installed; if you use it without University this fence could override other custom or original fences. If you want to enable this object to work with Sims 2 only (no EP) visit this threat at the SIMPE forum. 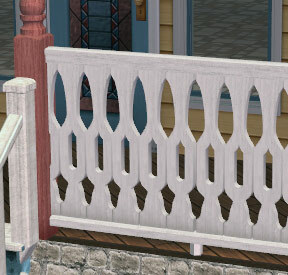 This is the base Deck Stairs mesh, it can be retextured I’ve made more textures for the victorian cottage classic colors collection. Open the staircase rar file. Extract the .Package file to your downloads folder. I want to build custom made house and community Lots. I would like to use your building materials to do this. Will it be possible to post them on any sites. I like MTS2, your site, and mainly none pay sites. Is there a place that I cannot post your content? or More specific where can I post your content without a problem. I will give credit to you for all content used and give your website for them to get additional materials. You may post my contents on free sites, or if they are part of a free package (zip, house, etc). This means no pay or donation.